Do You Remember... "The Adventures of Spin and Marty". The most popular series…or serial…that ever aired as part of ABC’s “Mickey Mouse Club” produced by Walt Disney was “The Adventures of Spin and Marty”. 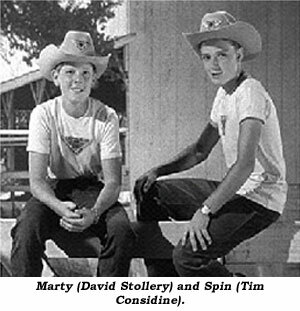 Set at the Triple R Ranch, a boys’ Western-style summer camp, the black and white 11 minute episodes were about 14 boys with the two central characters being the rich, spoiled, orphaned Martin “Marty” Markham (David Stollery) and Tim Considine as the popular, athletic Spin Evans at the Triple R.
Colonel Jim Logan (Roy Barcroft), owner of the Triple R, hired Bill Bur-nette (Harry Carey Jr.) as counselor for a group of boys arriving for the summer. In particular, city boy Marty has him worried as he’s coming to the camp for the first time—and accompanied by his butler Perkins (J. Pat O’Malley). Burnette can handle the young-er new kids and returnees like Spin, but he’s at a loss as what to do with Marty who arrives with a chip on his shoulder, an evident fear of horses and a contemptuous dismissal of the Triple R as “a dirty old farm”. overcome his fear of horses while another boy, Ambitious (B. G. Norman), becomes Marty’s first friend. Eventually, alliances brought about by a snipe hunt and a Haunted Valley incident coerce into a united effort by all the Triple R boys as they compete against a rival boys’ ranch in a rodeo. The first series of 25 eleven minute adventures were originally aired in late 1955. Produced at a cost of $573,480 between July and September, William Beaudine was the director with filming done at the Golden Oak Ranch in Newhall and Iverson Ranch. 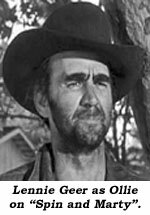 Stan Jones, composer of “Ghost Riders in the Sky”, played assistant counselor Frank and wrote “The Triple R Song, Goodnight Little Wrangler”, the campfire song. William Lava and Robert Jackman wrote the opening theme music, “Riding West”. Some of the other boys in the cast were Dee Aaker (Lee Aaker’s older brother) as Russell the Muscle, Sammy Ogg as Spin’s jokester sidekick Joe Simpson, Roger Broaddus as Freddie, Brad Morrow as Louie, Brand Stirling as Al, Tim Hartnagel as Speckle, Dale Hartleben as Biff, Jim Carlson as Pinky, Joseph Stafford as Gerald. Sammee Tong was the cook and B-western veteran George Eldredge was Dr. Spaulding. 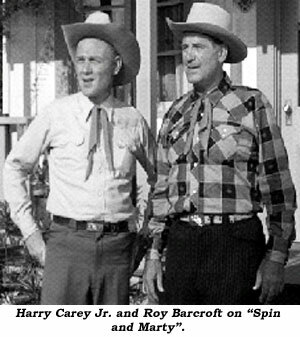 The rocky path to friendship between Spin and Marty and their interaction with the other boys and adults on the Triple R made a lasting impression on viewers and led to two sequels, “The Further Adventures of Spin and Marty” in 1956 (23 episodes) and “The New Adventures of Spin and Marty” in 1957 (30 episodes). The second series added Annette Funicello and Kevin Corcoran to the cast as Annette and Moochie. The third series added Darlene Gillespie and quickly lost its initial charm as it turned into a “Let’s put on a show” storyline. In October 2006, Stollery and Considine were honored as Disney Legends.